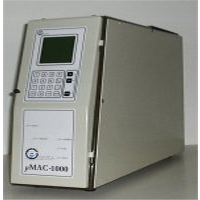 µMAC-1000 is an on-line portable analyzer, available either in mono or sequential mutiparametric configuration (µMAC-1000 MP), providing the highest level of analytical automation. 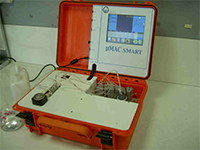 µMAC-1000 is the only high sensitivity multiparametric portable analyzer in the market; it uses the well known wet chemistry methods normally used in the laboratories. The analyzer can measure any type of water samples; a wide range of applications is available, including high sensitivity methods for nutrients analysis in seawater. Easy to use Sample analysis using µMAC-1000, is easy and friendly; the operator can run a sample only selecting a two keys analysis function on the integrated keyboard.